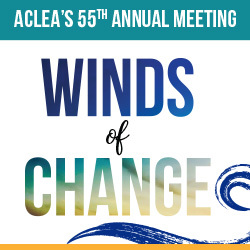 Join us in Chicago at ACLEA's 55th Annual Meeting! Our host hotel is the Swissotel Chicago. ACLEA has secured a special room rate of $199/night plus state and local taxes (currently 10.25 %) for single/double available until June 28, 2019, or until the room block is exhausted, whichever comes first. Additional travel details can be found HERE. Need assistance seeking approval from your employer to attend the ACLEA Annual Meeting? ACLEA has created a Meeting Resource Toolkit to help you!